According to NASA, the stunning effect captured in the photo is the result of blue light from the water in Antarctica’s McMurdo Sound. 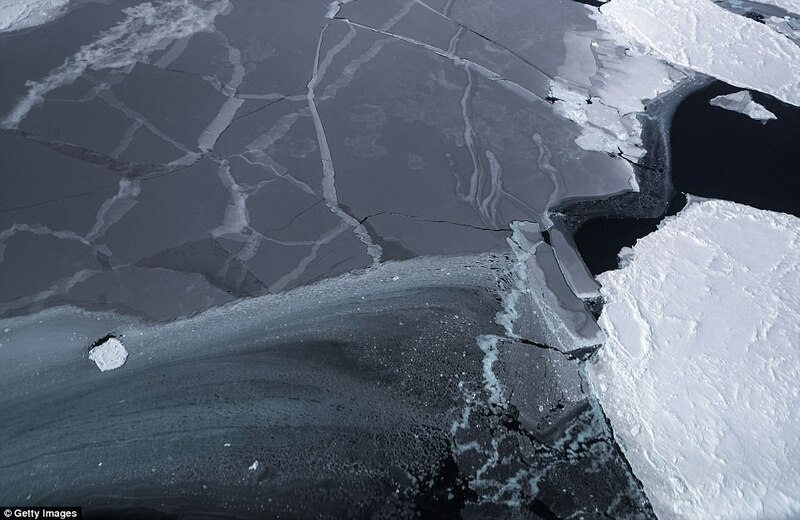 As water erodes the underside of the iceberg, it exposes older, bluer ice. 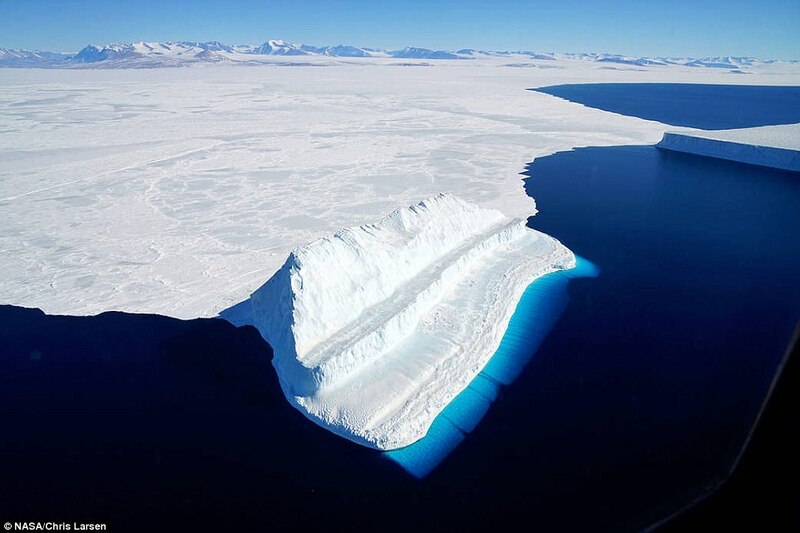 This blue ice is sometimes even pushed above the surface as erosion changes the shape of the iceberg, or even flips it over. The P-3 Orion has a scanning laser altimeter to measure surface elevation, three types of radar systems to study ice layers and bedrock underneath, a high-resolution camera to create detailed color maps, and infrared cameras to measure surface temperatures, according to NASA. It’s the most advanced suite yet, and the upgraded altimeter is far more powerful than those used in the past, firing 10,000 pulses per second. 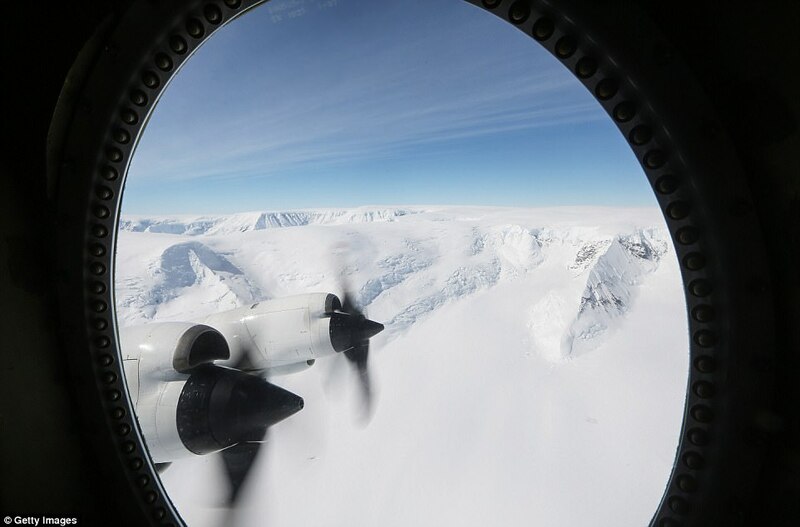 Operation IceBridge has been studying how polar ice has evolved over the past nine years, and just wrapped up a set of nine-hour research flights over Antarctica to monitor ice loss. In May, a NASA test pilot revealed stunning time-lapse footage from flight over Greenland’s southeast glaciers as part of the IceBridge campaign. The video gives a first-person perspective of a glacier-run in the P-3 Orion aircraft, revealing the icy waters and snow-topped peaks that dominate the remote landscape. 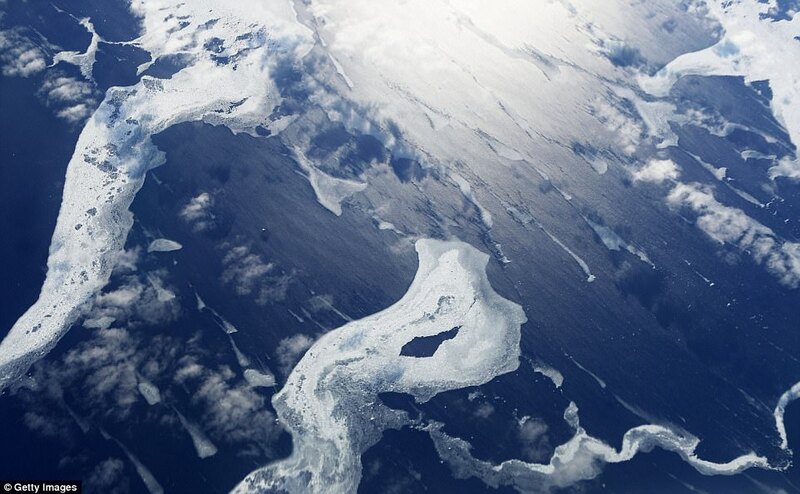 In the stunning footage shared on Twitter by test pilot Gerrit Everson, the expanse of snow and ice can be seen up close as P-3 Orion soars just overhead. The campaign uses NASA’s P-3 aircraft – a four-engine turboprop from the Wallops Flight Facility that can fly for 8-12 hours. 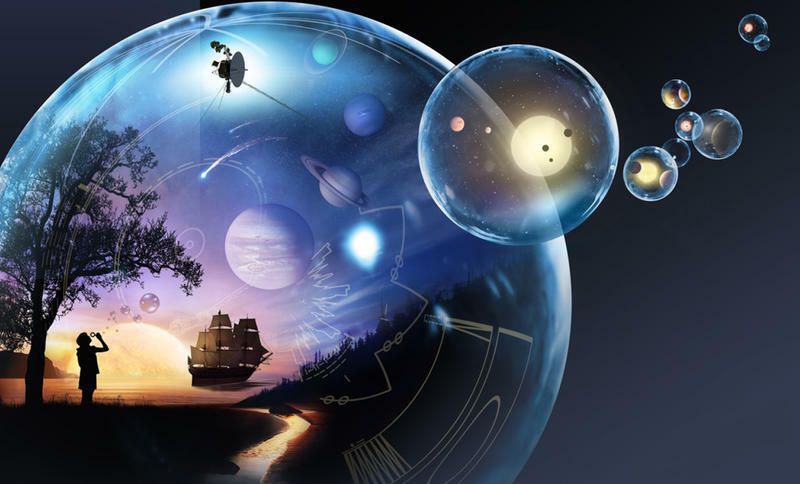 And, it’s equipped with a number of instruments that have made for more precise observations. It’s the most advanced suite yet, and the upgraded altimeter is far more powerful than those used in the past. ‘The new laser has a very narrow pulse that fires 10,000 pulses every second, compared to the old laser’s wider pulse at 3,000 pulses per second,’ said Jim Yungel, Wallops program manager for the laser altimeter, when the spring survey began. 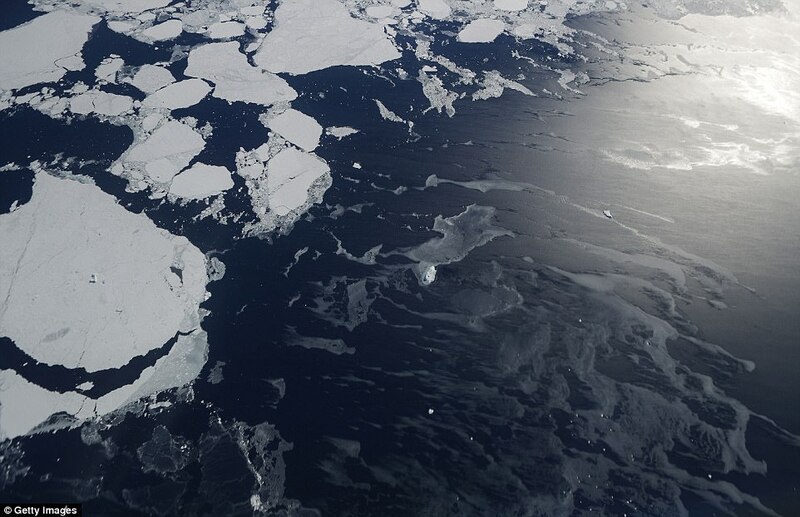 IceBridge is designed to support the upcoming Ice, Cloud, and land Elevation Satellite-2 (ICESAT-2), which will use lasers to measure the elevation of sea ice in the ocean. The satellite is set to launch in 2018. In the meantime, the P-2 Orion craft has been collecting massive amounts of data on the polar ice, revealing how the ice sheets are changing.